In controlled experiments, the ability of “Effective Microorganisms (EM, in the form of mudballs or Bokashi-balls)” was tested for clearing waters from cyanobacteria. We found suspensions of EM-mudballs up to 1 g l−1 to be ineffective in reducing cyanobacterial growth. In all controls and EM-mudball treatments up to 1 g l−1 the cyanobacterial chlorophyll-a (Chl-a) concentrations increased within 4 weeks from ≈120 to 325–435 μg l−1. When pieces of EM-mudballs (42.5 g) were added to 25-l lake water with cyanobacteria, no decrease of cyanobacteria as compared to untreated controls was observed. In contrast, after 4 weeks cyanobacterial Chl-a concentrations were significantly higher in EM-mudball treatments (52 μg l−1) than in controls (20 μg l−1). Only when suspensions with extremely high EM-mudball concentrations were applied (i.e., 5 and 10 g l−1), exceeding the recommended concentrations by orders of magnitude, cyanobacterial growth was inhibited and a bloom forming concentration was reduced strongly. In these high dosing treatments, the oxygen concentration dropped initially to very low levels of 1.8 g l−1. This was most probably through forcing strong light limitation on the cyanobacteria caused by the high amount of clay and subsequent high turbidity of the water. Hence, this study yields no support for the hypothesis that EM is effective in preventing cyanobacterial proliferation or in terminating blooms. We consider EM products to be ineffective because they neither permanently bind nor remove phosphorus from eutroficated systems, they have no inhibiting effect on cyanobacteria, and they could even be an extra source of nutrients. Anthropogenic nutrient over-enrichment of surface waters is the primary cause of cyanobacterial blooms and nuisance scum’s (Fogg, 1969; Reynolds & Walsby, 1975; Reynolds, 1987; Paerl, 1988, 2008). The massive blooms are a serious environmental problem and pose a risk to human health, as blooms may contain a variety of very potent toxins, and may produce stomach-turning odors and may cause high turbidity, anoxia, fish kills, and food web alterations (Codd et al., 2005; Dittmann & Wiegand, 2006; Paerl, 2008; Paerl & Huisman, 2008, 2009). Climate change is expected to aggravate hazardous blooms favoring cyanobacterial dominance in a wide range of aquatic ecosystems (Paerl & Huisman, 2008, 2009). This expectation is underpinned by the coincidence of the two hottest summers in Europe, 2003 and 2006, since recording started (Luterbacher et al., 2004; Rebetez et al., 2009), with major cyanobacterial nuisance. During the 2006 heat waves, at least 114 mostly shallow lakes and ponds in The Netherlands suffered heavily from cyanobacterial blooms. One of the seriously affected sites was Lake Gooimeer, a 2,576 ha shallow lake in The Netherlands, which includes a harbor (Almere-Haven) and a bathing area at the northern part of the lake. From August 2006 until the end of October 2006, a major cyanobacterial bloom caused fish kills and foul odors. As a consequence of this bloom, a swimming ban followed, the harbor was closed and the start and finish of the European Championship Triathlon had to be relocated to elsewhere. Following the 2006 heat-waves, many, mostly commercial, parties claimed to have Columbus’s egg to alleviate these undesirable cyanobacteria blooms. One of the most heavily promoted products was “Effective-Microorganisms” (EM®) in so-called “mudballs” or “Bokashi-balls”. They are based on the concept of Higa (1998) that addition of EM® would change the microbial community towards dominance of beneficial species, while suppressing harmful bacteria. Subsequently, EM-mudballs are claimed to wipe out cyanobacterial blooms, thereby making the infested waters clear again (http://www.emvereniging.nl accessed on June 28, 2008). The manufacturers intended to apply 12,000 EM-mudballs in Almere-Haven (The Netherlands). However, the authorities forbid the application of EM-mudballs because they contain heavy metals such as mercury as well as nutrients (Rijkswaterstaat, 2007). Moreover, the statements and claims about effectiveness were based on anecdotal evidence rather than on scientifically defensible evidence. In this study, we tested the claim that EM-mudballs would suppress and remove cyanobacteria from infested water in controlled experiments. The EM-mudballs were obtained from Agriton BV (Noordwolde, The Netherlands) and belonged to a batch of 12,000 EM-mudballs that were made with the intention of applying in Almere-Haven (The Netherlands). Almere-Haven consists of two harbors, each one has the size of 4 ha (mean depth 1.9 m, max depth 3 m) that had suffered from major Microcystis blooms in 2006. The EM-mudballs had an average fresh weight of ±300 g (A. de Puisselaar, B. V. Agriton, personal communication). The suggested dose was 1 ball per m2, which makes maximum in situ concentrations of 0.1–0.3 g l−1. To get an estimate of the potential release of phosphate from EM-mudball material, 0.5 g EM-mudball material was brought into 100 ml nanopure water in triplicate. Three additional Erlenmeyer’s only contained 100 ml nanopure water. The Erlenmeyer’s were closed with Parafilm and placed for 48 h in an incubator in darkness at 22°C, and continuous orbital shaking (200 rpm). After this, the material was centrifuged for 5 min at 3,000 rpm, followed by filtration over a 0.45-μm membrane filter. The filtrates were analyzed on soluble P as molybdate reactive phosphorus (Murphy & Riley, 1962) using a SKALAR auto-analyzer. Cyanobacterial scum material was harvested from Almere-Haven (The Netherlands) on August 16th and 28th 2007. The collected material was counted under a NIKON light microscope using a Burker Chamber and subjected to fluorescence analysis for estimating the contribution of major algal groups, i.e., cyanobacteria, chlorophytes, and diatoms to the overall chlorophyll-a (Chl-a) concentration using a PHYTO-PAM (Lürling & Verschoor, 2003). It revealed that the field material consisted of >95% M. aeruginosa (mostly present in large colonies) and some M. flos-aquae, Anabaena sp. and 2.5% chlorophytes. Pseudoanabaena sp. and Navicula sp. were present on the mucus of Microcystis colonies, but diatoms did not show up in the PHYTO-PAM signal. In the first experiment, cyanobacterial scum material was inoculated in 400-ml beakers that contained 250 ml suspensions of artificial algal growth medium (WC) medium (Lürling & Beekman, 1999) and EM-mudball material. The EM-mudball was tested in the following concentration range: 0 (untreated control), 0.01, 0.1, 0.25, 0.5, 1.0, 5.0 and 10 g l−1. Five replicates per concentration were used. The initial phytoplankton concentration was 127 (±8) μg l−1 Chl-a, which consisted of 95% cyanobacteria (121 ± 6 μg l−1). The Chl-a and the Photosystem II efficiency (ΦPSII) were measured using a PHYTO-PAM phytoplankton analyzer (Heinz Walz GmbH, Effeltrich, Germany). One of features of the PHYTO-PAM phytoplankton analyzer is that it uses four different excitation wavelengths, which allows a separation between cyanobacteria, green algae, and diatoms (Kolbowski & Schreiber, 1995; Heinz Walz GmbH, 1999; Lürling & Verschoor, 2003). The beakers were placed at random in a Gallenkamp ORBI-SAFE Netwise Orbital Incubator at 20°C, in 25 rpm and in a 18:6 h light:dark rhythm. The daily light:dark cycle was programmed so that the light intensity increased gradually to a maximum of 130 μmol quanta m−2 s−1 and subsequently decreased again to darkness, which resulted in a daily average light intensity of ~57 μmol photons m−2 s−1. Initially, and after 3, 6, 9, 12, 15, 18, 21, 24, 27, 30, 33, 36, 39, and 42 days samples were taken for analyses of Chl-a (and the share of cyanobacterial based Chl-a), pH (using a WTW-pH320 meter), conductivity (using a WTW-Cond 3300i meter), oxygen concentration and saturation (using an Oxyguard oxygen meter). Nanopure water was added to compensate for evaporation losses. The water quality variables (conductivity, pH, oxygen concentration, and saturation) and Chl-a concentrations (and the share of cyanobacterial based Chl-a) were statistically analyzed running repeated measures ANOVA in the tool pack SPSS version 16.0.1. When the ANOVA indicated significant differences a Tukey post-hoc comparison test was run to distinguish means that were significantly different (P < 0.05). On August 28th 2007, 220 l water with cyanobacteria was collected in the harbor of Almere-Haven and transported immediately to the laboratory. Here, each of eight aquaria was filled with 25 l of the water. The aquaria were placed in a temperature controlled water bath at 20°C and illuminated from above with 175 μmol photons m−2 s−1 in a 16:8 h light–dark cycle. The next day, four aquaria received an equal piece of EM-mudball (42.5 ± 2.2 g) each (treatments), whereas the four others were used as controls. Initially and after 1, 2, 3, 4, 6, 8, 9, 10, 13, 15, and 28 days samples were taken for analysis of Chl-a and ΦPSII, turbidity, pH, conductivity, oxygen concentration, and saturation as in the previous experiment. The temperature was measured with each of the above-mentioned meters. The evaporation losses were compensated with adding distilled water. The aquaria were sampled after mixing and resuspension of sedimented material. Water quality variables (turbidity, temperature, conductivity, pH, oxygen concentration, and saturation) and phytoplankton characteristics (Chl-a and ΦPSII) were statistically analyzed as in the previous experiment. The phosphate concentrations in filtrates of EM-mudball suspensions (5 g l−1) were 822 (±33) μg P l−1 and significantly higher (t test: t = 42.9; P < 0.001) than those in the controls, which were 6 (±1) μg P l−1. Hence, under the conditions employed in this study (48 h at 22°C in darkness at 200 rpm) EM-mudballs released 162 (±6) μg P g−1 EM mudball. In all controls and EM-mudball treatments up to 1 g l−1 the cyanobacteria Chl-a concentration increased within 4 weeks from ≈120 μg l−1 to 325–435 μg l−1 (Fig. 1). At very high EM-mudball concentrations (5 and 10 g l−1) cyanobacteria Chl-a concentration decreased from ≈120 μg l−1 to on average 8 and 5 μg l−1, respectively (Fig. 1). The repeated measure ANOVA indicated a significant time effect (F 14,434 = 84.4; P < 0.001), a significant EM-mudball concentration effect (F 7,31 = 53.5; P < 0.001) and a significant EM-mudball × time interaction (F 98,434 = 6.65; P < 0.001). A Tukey post-hoc comparison test revealed three homogeneous groups that were significantly different from each other: (1) 0, 0.01, 0.1, 0.25 and 0.5 g EM-mudball l−1, (2) 0.1, 0.25, 0.5 and 1.0 g l−1, and (3) 5 and 10 g l−1. In as much as the collected and inoculated scum material from Almere-Haven was not exclusively comprised of cyanobacteria, but also contained some chlorophytes, over the course of the experiment gradually more green algae were detected (Fig. 1). During the course of the experiment, in controls and EM-mudball treatments up to 1 g l−1 total Chl-a concentrations (cyanobacteria + eukaryotic algae) had increased from 127 μg l−1 to maximum values between 590 and 975 μg l−1 (Fig. 1). In contrast, high dosage of 5 and 10 g EM-mudball l−1 reduced the initial Chl-a concentration of 127 μg l−1 to on average 49 and 37 μg l−1, respectively (Fig. 1). The repeated measure ANOVA indicated a significant time effect (F 14,434 = 90.6; P < 0.001), a significant EM-mudball concentration effect (F 7,31 = 52.5; p < 0.001) and a significant EM-mudball × time interaction (F 98,434 = 5.93; P < 0.001). A Tukey post-hoc comparison test revealed four homogeneous groups that were significantly different from each other: (1) 0, 0.01, 0.1 and 0.5 g EM-mudball l−1, (2) 0.01, 0.1, 0.25, and 0.5 g l−1, (3) 0.25, 0.5 and 1 g l−1, and (4) 5 and 10 g l−1. A repeated measure ANOVA revealed a significant EM-mudball concentration effect on ΦPSII (F 7,31 = 58.7; P < 0.001). The ΦPSII was on average between 0.38 and 0.41 in controls and EM-mudball treatments up to 1 g l−1 (Fig. 2). In the 5 and 10 g l−1 treatments, ΦPSII was on average 0.31 and 0.16, and showed considerable variation among replicate (Fig. 2). Tukey’s test showed that ΦPSII in controls and EM-mudball treatments up to 1 g l−1 were similar, while the 5 and 10 g l−1 treatments were significantly lower and also significantly different from each other. Water quality variables were significantly influenced by the addition of different concentrations of EM-mudball material (Fig. 3). Suspensions with higher EM-mudball material showed rapid and stronger oxygen depletion followed by a gradual increase over the course of the experiment (Fig. 3A). Patterns for oxygen saturation were similar to those of oxygen concentration. The repeated measures ANOVA revealed significant time effects (oxygen concentration: F 14,434 = 183.7; P < 0.001, saturation: F 14,434 = 87.9; P < 0.001), significant EM-mudball concentration effects (oxygen concentration: F 7,31 = 525.2; P < 0.001, saturation: F 7,31 = 622.4; P < 0.001), and significant time × EM-mudball interactions (oxygen concentration: F 98,434 = 19.5; P < 0.001, saturation: F 98,434 = 23.8; P < 0.001). Tukey’s post-hoc comparisons revealed similar homogeneous groups for both oxygen concentration and saturation: (1) 0 and 0.01 g l−1, (2) 0.1 and 0.25 g l−1, (3) 0.25 and 0.5 g l−1, (4) 1 g l−1, (5) 5 g l−1, and (6) 10 g l−1. Adding EM-mudball material caused significant turbidity in the water (F 5,24 = 197.1; P < 0.001). When turbidity was measured directly after the EM-mudball suspensions had been made, mean values were 77, 81 108, 246, 324, 443, <1,000 and <1,000 NTU for controls and increasing EM-mudball concentrations, respectively (Fig. 3B). The majority of the suspended matter settled within 3 days and after 2–3 weeks, the increase in turbidity paralleled the increase in Chl-a (see Fig. 1). No major differences in pH of the various incubations were observed (Fig. 3C). Nonetheless, the repeated measures ANOVA indicate a significant time effect (F 14,434 = 233.1; P < 0.001), a significant EM-mudball effect (F 7,31 = 39.0; P < 0.001), and a significant time × EM-mudball interaction (F 98,434 = 9.14; P < 0.001). Three homogeneous groups were distinguished by a Tukey test in the order from higher to lower pH: (1) 0–0.5 g l−1, (2) 0.1–1 g l−1, and (3) 5 and 10 g l−1. The conductivity of the water was affected by the EM-mudball material where higher concentrations of EM-mudball caused higher conductivity (Fig. 3D). The repeated measures ANOVA indicate a significant time effect (F 13,403 = 27.3; P < 0.001), a significant EM-mudball effect (F 7,31 = 124.5; P < 0.001), and a significant time × EM-mudball interaction (F 91,403 = 2.50; P < 0.001). Four homogeneous groups were distinguished by a Tukey test that in the order from lower to higher conductivity were: (1) 0–0.25 g l−1, (2) 0, 0.25, 0.5, and 1 g l−1, (3) 5 g l−1, and (4) 10 g l−1. The water from the Lake contained 113 μg l−1 of Chl-a of which 96 μg l−1 was from cyanobacteria. After 1 day in the laboratory, these concentrations had increased to 141 and 122 μg l−1, respectively (Fig. 4). Then Chl-a concentrations both in treated and untreated aquaria decreased in a similar way for some days, stabilized for 1 week and started to increase again, but only in the treated aquaria (Fig. 4). Averaged over time there was no difference between controls and treatments in the total Chl-a concentrations (F 1,6 = 0.10; P = 0.761) and the cyanobacteria Chl-a (F 1,6 = 0.13; P = 0.731). However, after 28 days, total Chl-a (t = 3.72; P = 0.010) and the cyanobacterial Chl-a concentrations (t = 6.00; P = 0.001) were significantly higher in the treatments than in the controls (Fig. 4). Total Chl-a concentrations were 100 (±21) μg l−1 and 47 (±19) μg l−1 in treatments and controls, respectively. After 28 days, cyanobacterial Chl-a concentrations were 53 (±7) μg l−1 and 20 (± 8) μg l−1 in treatments and controls, respectively. This might be caused by the release of phosphate as a 48 h incubation (in darkness, at 22°C) of EM-mudball material revealed a release of 162 (±6) μg PO4–P g−1 EM mudball (N = 3). In EM-mudball treatments, despite initial high productivity, within a few days a sharp drop in oxygen concentrations and saturation was observed (Fig. 5). After 9 days, oxygen concentrations in controls and treatments resembled each other. Averaged over the entire experimental period, oxygen concentrations (F 1,6 = 423.3; P < 0.001) and saturation (F 1,6 = 361.0; P < 0.001) were significantly higher in controls than in the EM-mudball treatments (Fig. 5). The pH appeared significantly lower in the EM-mudball treatments than in controls (F 1,6 = 130.5; P < 0.001). Conductivity was significantly higher (F 1,6 = 58.8; P < 0.001) in the EM-mudball treatments than in controls (Fig. 5). Turbidity (F 1,6 = 5.39; P = 0.059) and temperature (F 1,6 = 1.40; P = 0.281) were similar in controls and EM-mudball treated aquaria (Fig. 5). The ΦPSII varied between 0.4 and 0.55, but there was no difference (F 1,6 = 4.22; P = 0.086) in ΦPSII of cyanobacteria in controls and EM-mudball treated aquaria (Fig. 6). 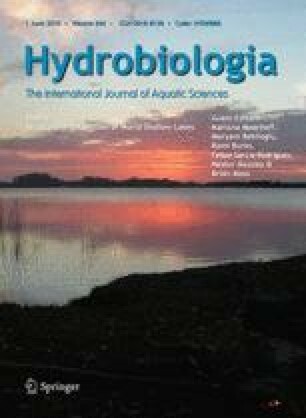 The results of this study clearly showed that within the 4–6 weeks experimental periods EM-mudballs were ineffective in suppressing and removing cyanobacteria from infested water, both in artificial medium and lake water. Only in suspensions with very high concentrations of EM-mudball material (i.e., 5 and 10 g l−1), the phytoplankton biomass was reduced strongly. This, however, can be attributed to initially very high turbidity of the water causing strong light inhibition, attachment to mud and burial of Microcystis (Verspagen et al., 2006). Moreover, it is not advisable using such high concentrations of 5 and 10 g l−1 in situ as it would result in many additional centimeters of sediment, strong oxygen consumption which might be hazardous to many aquatic animals especially fish fauna, may cause release of nutrients and the input of heavy metals (Rijkswaterstaat, 2007). Also when parts of EM-mudballs were dropped in lake water, resembling actual applications, the mudballs gradually disintegrated without having the claimed effect on the cyanobacteria. This experiment showed that after 4 weeks EM mudballs, as compared to the controls, actually promoted cyanobacterial growth rather than inhibiting it. In as much as the dosage was even higher than has been suggested being effective, the results are not in favor of the claim that EM-mudballs are effective in suppressing and removing cyanobacteria from infested water. The underlying idea in adding EM-mudballs to a water body might be promotion of the bacterial flora as bacterial competitive superiority in terms of phosphorus uptake has been described well (e.g. Currie & Kallf, 1984a, b). However, in eutrophic lakes bacteria might be P and C limited leading to stronger increase in algal abundance than bacterial abundance (Lean & White, 1983; Currie, 1990). Bacteria are on the menu of grazers, such as heterotrophic nanoflagellates (Sheldon et al., 1986), while the success of cyanobacteria is often explained from their grazing resistance (Lampert, 1987). The grazing activity of heterotrophic nanoflagellates might promote the release of phosphate from the P-rich bacteria by several hundreds of percents (Bloem et al., 1988). Consequently, phytoplankton might flourish in freshwater systems despite bacteria often dominate the P uptake, which is corroborated by controlled experiments revealing that bacterivorous nanoflagellates could prevent a strong competition for phosphate between algae and bacteria (Pengerud et al., 1987). The manufacturers of the EM-mudballs claimed that the ‘Effective Micro-organisms’ would “consume the phosphates and eat away the cyanobacteria” (http://www.emvereniging.nl/index2.php/weblog/C11/P34). If the EM had been effective in removing phosphate, a sharp decline in the ΦPSII of the cyanobacteria should have been observed (Wykoff et al., 1998). However, the ΦPSII revealed the cyanobacteria were in good physiological state. Moreover, in artificial medium the cyanobacteria and algae expressed good growth even in high doses of EM-mudball suspensions, while in aquaria with EM-mudball material cyanobacteria remained present and reached higher concentrations than the controls. These results not only show that cyanobacteria were not eaten away by the so-called EM, but also suggest that EM-material might even further aggravate a cyanobacteria bloom through the release of phosphate. A short term (48 h) experiment revealed a release of phosphate of about 162 μg P g−1 EM mudball. In the 8 ha harbor area of Almere-Haven, based on the leachate experiment, the intended application of 12,000 EM-mudballs would then have led to an increase of water column P by 4 μg l−1, or even more through bacterial mineralization of mudball material on the sediment (Kairesalo et al., 1995). Further, as application of EM-mudballs cause a drop in oxygen concentration, release of phosphate direct from the sediment or associated bacteria is expected (Hupfer & Lewandowski, 2008). Hence, this study provided no evidence for the manufacturers claims. Although it has been asserted that EM-cocktails contain about 80 species of micro-organisms, such as photosynthetic bacteria, lactic acid bacteria, actinomycetes, yeasts and fermenting fungi (Higa, 1998), such claims could not be confirmed by independent research (Van Egeraat, 1998; Van Vliet et al., 2006). The addition of EM to slurry manure had no effects on the composition of the bacterial community present in the slurry manure; EM had no effect on the chemical composition of the manure and no effect on grass production (Van Vliet et al., 2006). In experiments on agar plates, Van Egeraat (1998) found no effect of micro-organisms in EM-1® on the growth of eight test bacteria (species belonging to the genera Azotobacter, Rhizobium, Pseudomonas, Bacillus, Streptomyces, Mycobacterium, Serratia and Escherichia), one yeast (Saccharomyces) and one fungus (Penicillium). Therefore, and because EM-products contain common micro-organisms already present in the environment, we doubt that an EM-application will have the potential to change the microflora in situ. Manufacturers recommend dosages of 1 EM-mudball per square-meter or 1 ball per 1 to 10 m3 of water (http://www.eminfo.nl/HuisEnTuinBrochNLweb.pdf; www.em-natuurlijk-actief.com/NL-ned/HuisEnTuinBrochNLweb.pdf; http://www.emamerica.com/; Agriton BV). The total surface area of the Almere harbors is 8 ha, for which 12,000 mudballs in this case 0.15 mudball per square meter was considered sufficient by the manufacturers. It should, however, be taken into consideration that the Almere-Haven area is part of a large (2,576 ha) shallow lake (Gooimeer), where the majority of the Microcystis bloom is being produced outside the harbor area. The water quality in the Almere-Haven area is strongly influenced by the Gooimeer, and mitigating the cyanobacterial nuisance in the harbor area seems only to be possible by strong nutrient reduction in the large lake Gooimeer (Burger et al., 2007). With massive blooms and scum being produced on the lake and driven into the harbor area by wind action, the suggested EM-application in the harbor would have been of no use. The Centre for Water Management (Ministry of Transport, Public Works and Water Management, Directorate, General for Public Works and Water Management, Lelystad, The Netherlands) has estimated a total of 0.25 gram mercury in the 12,000 mudballs, or about 21 μg per mudball (Rijkswaterstaat, 2007). Completely mixed through the water column in the harbor this would have yielded about 1.6 ng mercury l−1. Although this concentration is below the maximum allowable concentration of 1.2 μg mercury l−1 (RIVM, 2008), in regulation 2455/2001/EC of the European Union, mercury has been pointed out as a priority dangerous compound of which discharge into the water is no longer allowed (Rijkswaterstaat, 2007). As EM-products (EM-mudballs or EM-suspensions) might contain such undesirable compounds, might vary in quality (Van Vliet et al., 2006), will not permanently fix or remove phosphorus from eutroficated systems, have no inhibiting effect on cyanobacteria, and could even be a source of nutrients, we consider EM non-effective in mitigating eutrophication as such and blooms of cyanobacteria in specific. The primary cause of cyanobacterial blooms is an over-enrichment of the water with nutrients, in which phosphorus plays a key role (Schindler, 1977; Schindler et al., 2008). Hence, in reducing eutrophication, source-oriented measures principally targeting the phosphorus inflow and internal loading remain essential. We wish to thank Wendy Beekman, Dr. Carol Soares (AEW), and Dr. Hans Ruiter (Centre for Water Management) and Drs. Gert Butijn, and Ton Vrieze (Directie IJsselmeergebied) for fruitful discussions. We thank Mr. A. A. de Puisselaar (Agriton, B. V., Noordwolde, The Netherlands) for delivery of the EM-mudballs. This study was supported by the Ministry of Transport, Public Works and Water Management, Directorate, General for Public Works and Water Management, Directie IJsselmeergebied. Heinz Walz GmbH, 1999. Phytoplankton Analyzer PHYTO-PAM. System Components and Principles of Operation, 1st ed. http://www.walz.com. RIVM, 2008. Kwik en kwikverbindingen. http://www.rivm.nl/rvs/stiffen/prio/totale_prior_stoffenlijst.jsp (in Dutch).